GUEST BLOG / By Bobbie Bagel, writer, Save Our Heritage Organisation--San Diego preservationists and avid gardeners far and wide have good reason to celebrate. 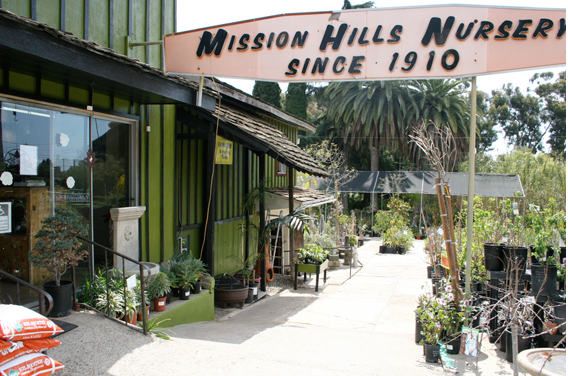 In January, Fausto Palafox joyfully announced his family's successful purchase of the land the historic Mission Hills Garden Center occupies. The future of this beloved historic landmark and community treasure is now secure. The nursery, at the colorful corner of Palmetto and Fort Stockton, has had only three owners in its 107-year history. The incomparable horticulturist and nurserywoman Kate Sessions founded it in 1910. Sessions sold both the business and the property to Giuseppe Antonicelli in 1922. The business thrived for close to seven decades. In 1989, Antonicelli's son, Frank, sold the nursery business (but not the property—for tax reasons) to the Palafox family. The family had received the "right of first refusal" on the land when they purchased the nursery in1989. They exercised that right when Frank Antonicelli's wife, Elsie, passed away fifteen months ago. A number of serious complications almost derailed the sale. However, after difficult negotiations, the transaction has been completed. Toni and Fausto Palafox credit their son, "Tiger" Palafox, for handling the complex banking and legal issues involved in the sale with skill and determination. And they gratefully thank their neighbors and customers in the Mission Hills area and beyond for unwavering support throughout the lengthy ordeal. MEDIA MONDAY / WHY FAKE NEWS?